If the internet is a secure site also fill in the user and password to access the file. To load ( and test the url ) you can use Load now. If you always want an updated phonebook check the Reload at startup option. Audio file location : change the location where the recordings are stored on your device, or where to get the files for playing. This submenu is used to setup general settings about your SIP connections. Fill in the username you use to log in at your server. Fill in your password belonging to your username. Fill in the address of your SIP server. You can also fill in a name that will be shown to the callee. Check this option to automatically answer the incoming SIP call. Here you set the port to use for the RTP stream. 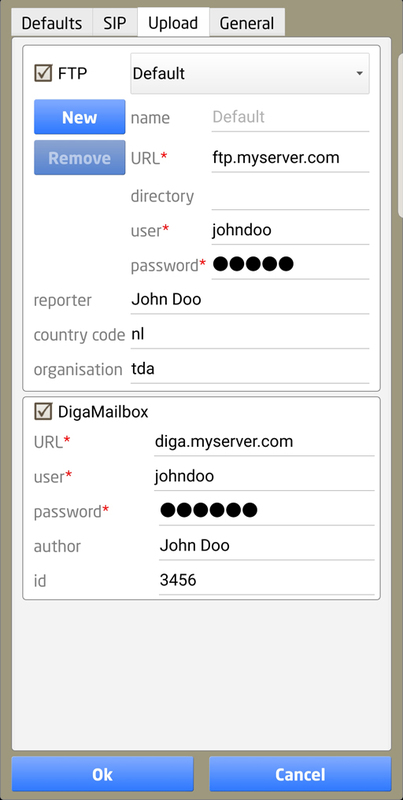 To be able to send your audio file through FTP or DigaMailbox, please fill in the URL of your FTP / DigaMailbox server, your user name and password. You can also enter your reporter / author and organisations name and country code. For DigaMailbox you also need to fill in your David id. For FTP you can define more servers to be available, press New to create one and fill in the credentials. Press Remove to remove the selected FTP server. If you switch on the FTP or DigaMailbox they will be shown as a publish options in the settings menu, and in the ‘Edit’ screen. You can save all of your License & Settings data to a compressed zip Archive, and restore it at will. See section “Backup or Restore your Settings” for more detail. On connecting to a station you can divert your incoming phone calls to a different phone number. When selected you can set the sequence string of activating the call forward, like **21*phonenumber#. Also set the sequence for deactivating the call forward like ##21#. Check your phone company for the right sequence. Note: Android filters out the international + sign, so for international calls fill in the whole sequence. Android system only have input presets for selection of the audio input, when your device has a separate camera microphone you can selected it here as ‘Camcorder’ preset. By this option the cross talk on the headset will be cancelled. If you use a headset or MIKI cable and the radio-station hears themselves back too loud, turning compensate On is advised. This will cause LUCI to output inverted audio on the L and R headphone output, thereby cancelling any cross-talk back into the microphone input via the headset connector itself. If you enable this, a newly recorded file will be automatically loaded, ready to be played. Having 4 options, record only the Microphone audio, only the return stream audio or a Mix of both, or Microphone and return stream in separate channels. When selected the Microphone fader will have a range from -oo to +20 dB in stead of the standard -20 dB to + 20 dB. Used for fade outs. You can (un)set this to prevent changing the microphone gain accidentally. Changing the behaviour of pressing the little microphone icon on the main screen to Mute. This will prevent disconnecting accidentally by means of a double check dialog. Display meters indicating the jitter on the displays IN stream and, if supported by the receiver, on the OUT stream. Adds a large clock on the main screen.